Powder Keg | Theater | Style Weekly - Richmond, VA local news, arts, and events. Theatre Review: Virginia Rep’s “The Whipping Man” is far more than just a compelling historical backdrop. Aaron Sutten Taamu Wuya as John, Max Eddy as Caleb and Jerold Solomon as Simon in Virginia Rep’s powerful drama “The Whipping Man” set in the aftermath of the Civil War. It would be a shame if only Civil War aficionados go to see Virginia Repertory Theatre’s “The Whipping Man.” While set in the chaotic days immediately following the surrender at Appomattox, this engrossing, surprising stage drama is so much more than a war story. As the best theater does, it tells a small, specific and intensely personal story that asks big, existential questions: Is each of us defined by our race or our faith? Or by something else entirely? Finding answers to these questions, even when they aren’t looking, are two former slaves and a wounded Confederate soldier. The kind and wise Simon (played by Jerold E. Solomon) and the sly and spirited John (Taamu Wuya) are scratching out a living in the ruins of bombed-out Richmond when Caleb (Max Eddy), the son of their former owner, stumbles back into their lives. Because of an untreated bullet wound, gangrene is eating away at Caleb’s leg. How Simon and John deal with his injury is the first of many dicey and defining dilemmas the three men will face. Director Debra Clinton uses all of the resources available at Virginia Rep to stage a riveting production. Before the action even starts, while smoky light streams through the shattered windows of the ransacked mansion where Simon and John have holed up, you know this show is going to look gorgeous. Lighting designer B.J. Wilkinson and set designer Kat Conley show a remarkable attention to detail from beginning to end. Playwright Matthew Lopez, who put in time as a staff writer on Aaron Sorkin’s “The Newsroom,” knows how to ratchet up the interpersonal tension, and the complications he develops here mostly involve skillful revelations about the past. Beyond stoking the dramatic fire between the characters, Lopez’s plot twists reveal how the Civil War shattered pretenses of the past, leaving Southerners in a social and cultural wilderness. He also manages to evoke intriguing issues involving faith by making all of the characters Jewish, with African-Americans having adopted the customs of Caleb’s family. The centerpiece of the second act is a makeshift Passover Seder unlike any you’re likely to see. Recounting the Jews fleeing slavery in Egypt reinforces the importance of the American emancipation, while further confusing the men’s relationships. Broadway veteran Solomon made a triumphant return to Richmond theater with a stirring performance in last year’s blockbuster, “The Color Purple,” and he does stellar work here as the steady center in the midst of the turmoil. Simon draws strength from his faith and from his family and, while threats develop to both, Solomon expertly conveys the effects. He has exceptional support. Eddy manages to humanize a character discovering just how dramatically his world has changed. Wuya delivers a pivotal performance while John struggles with the choices that will define him. 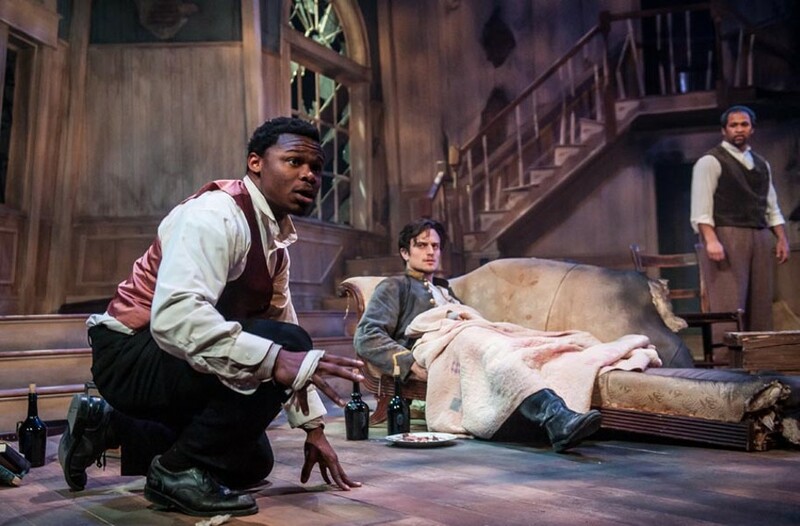 “The Whipping Man” plays Virginia Rep’s November Theatre through March 8. Visit va-rep.org for tickets and information.